We recently hosted Packaging Experience Summit 2019, a 2-day conference in Seattle focused on digital print and the latest packaging technologies. Our stellar lineup of expert speakers and panelists included Phil Stafford, Sr. Global Alliances Manager at Digimarc, an industry leader in digital watermarking technologies for packaging. With decades of experience in the industry, Phil understands how emerging technologies can change the way consumers interact with packaging — and that it is imperative for brands to take notice. 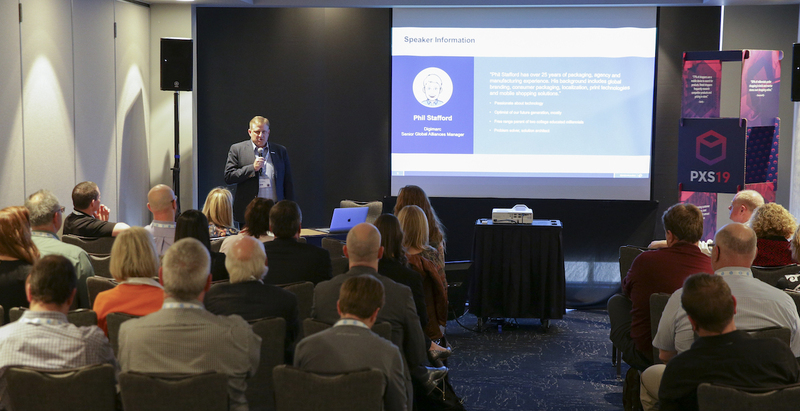 In his presentation at PXS19, Phil discussed the changing landscape of product packaging and how brands now have the opportunity to leverage digital innovations to empower their omnichannel strategies. Considering that over one half of US households use Amazon Prime, many major established brands are now being forced to react to the on-demand nature of eCommerce and the unique requirements that are often imposed by online retailers. These same consumer packaged goods (CPGs) are looking closely at the emerging online brands, who are not tied to a long-term brick-and-mortar supply chain process. On the retail side, today’s consumers demand real-time information in the aisle. In fact, 77% of shoppers use a mobile device while in-store. This challenges brands to offer an interconnected retail experience — tying their physical pack to the digital space. Since packaging real estate is limited, brands must explore ways to integrate technologies to improve the shopping experience. In his presentation, Phil discussed the benefits of digital barcodes for product packaging and labels for a comprehensive omnichannel strategy. Omnichannel is a multichannel approach to sales that aims to provide consumers with an integrated shopping experience, whether they're shopping online or in a brick-and-mortar store. On the supply chain side, digital barcodes improve efficiencies throughout the product lifecycle, from production to inventory management, to the end consumer. Digital barcodes also offer track-and-trace security capabilities to deter counterfeits, prevent tampering, and ease the quality and batch control processes. On the consumer side, digital barcodes can link to mobile apps to create a connected packaging experience. “Every shopper has a mobile device in their hand when they are shopping in-store and doing product research. These devices are the key to extending and supporting a brand and their message,” Phil says. According to Phil, digital disruptors are building their brands online and then moving into retail to prove their success. It’s time for the established brands to work in reverse, creating consumer experiences that work for an omnichannel world. Utilizing the latest technologies, such as digital barcodes and digital print, makes creating an omnichannel experience easier for brands. It gives them the ability to be flexible and adapt to the ever-changing needs of their customers. If you missed Packaging Experience Summit 2019 but you’re interested in learning more about the latest packaging technologies, sign up for a BoxMaker University class today. We host small group classes throughout the Pacific Northwest, tailored to deliver informative packaging content for brands and businesses of all sizes. BoxMaker University is a great way to increase your knowledge across a range of relevant packaging and related topics by learning directly from experts in the field. Each session is an interactive, engaging and enjoyable journey into the world of packaging. Take a look at our upcoming sessions and sign up for our email newsletter to be notified when BoxMaker University comes to your city.